By 1600BC the great cities of the Indus valley had been abandoned. Quite why the people left is uncertain. Perhaps repeated flooding or shifts in the river beds destroyed the harvests and wrecked the once buoyant economy. The gradual drying up of the great Saraswati River caused a serious decline in agricultural productivity. There is also evidence of malaria and probably cholera, which must have taken their toll. The arts of city life, such as writing, disappeared. Although some regions continued to prosper, notably Gujarat in the south west, many areas saw a decline in their population. Eventually, indo-Europeans from central Asia invaded the valley and settled among the existing population. Many farmers and pastoralists moved into adjacent regions in the south and east, and, slowly, sand silt buried the ruins of the cities. But the Indus culture did not die. Although the Indo Aryan languages of the new settlers from the west eventually prevailed, the indigenous Dravidian languages had a strong influence on their vocabulary grammar and pronunciation. The Hindu religion that crystallized in the 1st millennium BC combined elements introduced by the Indo Aryans with the earlier beliefs of the inhabitants of Indus Valley settlements such as Harappa. Today, many features of modern Indian life have their roots in the Indus civilization- the first great flowering of culture in the subcontinent. The prosperity of the Indus merchants was based not on military superiority all the evidence shows that they were peaceful people – but on intellectual sophistication. The cities used a written language for example. Excavators have discovered numerous square seals, mainly of soap stone, engraved with animals and other symbols. The seals were used as signatures, stamped onto bales of merchandise to identify the owners or issuing authority. Most scholars believe that the symbols derive from an early Dravidian language, from the same family as Tamil and other languages of southern India. 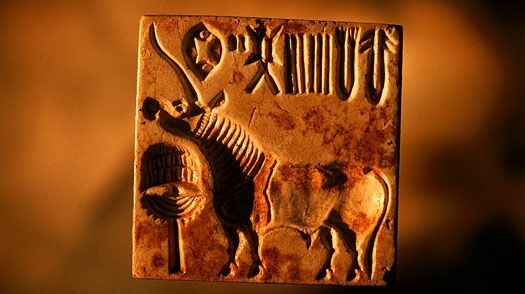 The keenly observed animals pictured on the seals offer the most impressive surviving examples of the Indus people’s artistic skills. The most common motif is a one horned antelope. It is shown in profile and could represent a two horned creature with one horn hidden. More probably, it represented a unicorn terracotta figures of this mythological creature have been found. Some seals show a grotesque animal with a man’s head, a bull’s horns, an elephant’s trunk, a ram’s forequarters, and tiger’s hind legs. One bizarre image has fascinated archaeologists; a man seated in a yogic position, wearing horned headgear, he has been identified as a prototype of the god Shiva, a deity known as the Destroyer but also a lord of fertility. The goddesses that feature on some seals closely resemble the forms take by Shiva’s consort- variously known as kali, Parvathi or Durga. The Indus cities also used standardized weights and measures. The basic unit of weight was equivalent to just under 14 grams; linear measurements were based on a ‘cubit’ of about 53 cm, from the length of a man’s forearm. Archaeologists found a bronze ruler at Harappa marked with cubits. 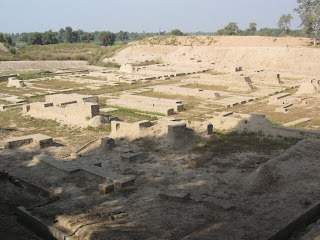 Nothing is known for certain about the social system of Harappa and the other Indus cities. A class of priestly rulers probably governed the communities. Peasant farmers, fishermen, and nomadic pastoralists were the backbone of society. Artisans such as carpenters, metal workers, potters and workers of gemstones would have occupied the next level up in the social order. 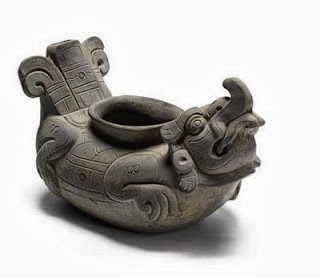 Craftsmen shaped tools from stone, copper or bronze- iron was unknown; bowls and jars were created mainly from clay or wood. Other crafts, notably spinning and weaving, would have been practiced in every household. Rich merchants may have comprised an elite class above the artisans, trading with the other cities of the Indus Valley and, according to ancient texts from Mesopotamia, with places as far away as Sumer in modern Iraq. Indus merchants established trading communities in Sumerian towns, and Indus ivory, gold, carnelian, and agate beads, timber, and other goods had an important place in Sumerians’ import business; in return they may have exported fine textiles, perfumed oils, and other perishable of which no traces survives. The Indus people also traded with neighbouring hunter gatherers and the fishing communities of Gujarat and the Aravalli hills, south of the river valleys- regions that supplied ivory, carnelian, agate, copper, tin, and many other raw materials. 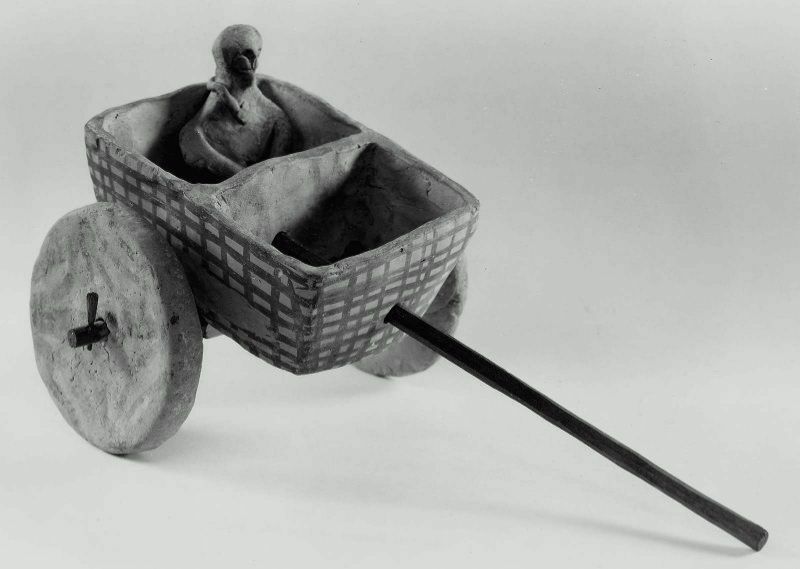 Goods were carried between settlements in ox carts with solid wheels; for longer journeys, the merchants used pack animals or river craft resembling today’s Indus house boat. The towns of the Iranian plateau to the west and Tukmenia to the North West had long been trading partners of the Indus people and their ancestors. This trade took a new turn when the Indus authorities established au out post at Shortugai, far to the north, to control the supply of lapis lazuli- the most valued commodity in west Asia, which at that time came only from Badakshan in Turkmenia that is in present day Afghanistan. The most astonishing aspect of all Indus cities was their advanced system of town planning. Within the thick outer walls- probably a defense against flooding-large blocks of houses were separated by a grid of broad roads. Houses were terraced; they varied in size, but were all designed around an inner courtyard, usually with a staircase leading to an upper floor. Much of the daily life of the citizens took place in the courtyard, as it does in Indian homes today. The people were fastidious about personal hygiene. The houses contained bathrooms, and often brick lavatories, which were connected t a system of drains which followed the routes of the streets, punctuated by the manholes, gutters, and wells. The houses contain slight traces of elaborate woodwork, and the plastered walls and floors may have been painted or covered with mats and hangings. Finds of jewellery, vivacious figurines, and lively painted pottery show that the Indus people did not lack artistic imagination or colour in their daily lives. But there seems to have been little room for more permanent secular or even religious art, only sparse evidence of which has survived. Apart from a few elaborate sculptures, no large statues have been discovered in the region only a vast quantity of clay figurines. 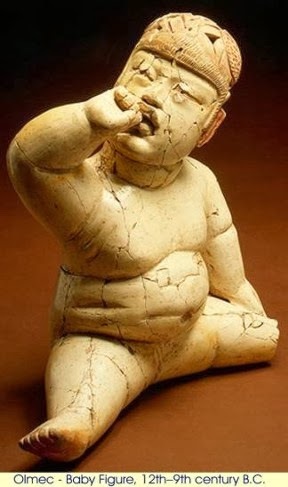 Some figurines represent naked, bearded men, but most of them are well rounded female forms, full breasted and wide hipped- probably images of the great mother goddess who was worshiped in various guises throughout the Middle East at the time. 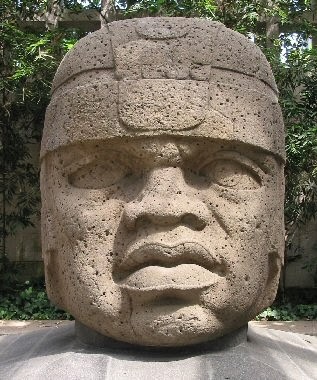 Their bodies are adorned with heavy necklaces and fantastic bulging headgear in which lamps could sometimes be mounted. Other figurines include a large number of toys such as ox drawn carts. Some of these models may have been intended as religious offerings rather than as mere playthings. The climate in Harappa was probably as hot and dry then as it today, and the crops- with the exception of rice and millet, which were not cultivated until around 2000BC, the bounty of the Indus was matched or exceeded by another river system running parallel to it to the south- the ‘lost Saraswati ‘which survives today only in the form of minor rivers such as the Hakra. The area watered by this mighty river was probably the breadbasket of civilization. The Indus people certainly ate fish from the rivers and hunted big game- wild ox, elephant, tiger, and rhinoceros- which was more plentiful then than now. Some farmers kept chickens, cattle, buffalo, sheep, and goats; others specialized in herding animals, driving them between seasonal pastures. At the foot of the citadel in Harappa were workshops and brick paved floors, some of which may have been used for husking grain. North of these is a structure once identified as a granary, now thought to have been a large public building. 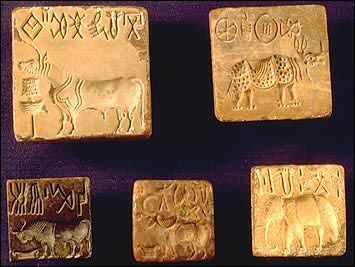 In the small Indus town of Lothal, near the western coast in Gujarat, the citadel held a large warehouse containing clay seals which bore the imprint of the cloth packaging to which they had been fastened. Spacious residential quarters stretched out beneath the Harappan citadel. Recent surveys have revealed the staggering size of the Indus cities, much of which lay hidden beneath deep layers of alluvium; Harappa covers more than 370 acres; Mohenjo-Daro sprawls across 618 acres. South of the citadel at Harappa lay the Cemetery. The graves of the Indus valley people were built on the same generous scale as their cities. The average size was 3.3m by 1.2m, though some were as large as 4.5mby 3 m. recent work at Harappa has now revealed new information about burial practices. The dead lay on their back or sides, their heads towards the north, and were sometimes wrapped in a textile shroud. Objects buried with the bodies included copper rings, stone and shell necklaces, and mirrors of polished copper. Pots were the main offering usually filled with food and drink; frequently, they were placed in the grave first and covered with soil, and the coffin was placed on top of them. Harappa is an advanced planning on a vast scale. More than 4,000 years ago, a merchant people built great cities of brick at Harappa and elsewhere in a valley of what is now Pakistan. They developed a written language that remains an enigma, and left an indelible mark on Indian culture. In 1856 two British engineers the brothers john and Robert Brunton, where contracted to build a railway link between Lahore and Multan in what is now in Pakistan. They were immediately faced with a problem. The alluvial soil of the Indus Valley through which the proposed railway was to run was rich landscape for cultivation crops, but almost completely lacking in stone to act as ballast for the railway tracks. The Bruntons solved this problem in a way that must have impressed their employers, but which created an archaeological disaster. Near the village of Harappa in the north, they had discovered huge deposits of ancient, baked mud bricks. These would make perfect ballast for their building project, the Bruntons decided, and they laid 160 kilometers of track on the ancient bricks. After the brothers plunder, Britain’s then director general of archaeology in India, Sir Alexander Cunningham, carried out a small excavation at Harappa. He concluded that little was left, but he did publish details of an inscribed seal found earlier at the site which bore a picture of a bull and sic strange symbols. More than half a century elapsed before this enigmatic clue to India’s early history was pursued. In 1921, under a newly appointed director general, Sir John Marshall, detailed excavations began at Harappa. Marshall’s team uncovered the scant remains of a large city- a find that turned out to be the first of a series of epoch making discoveries proving the existence of a hitherto unknown culture, the Indus Valley civilization, which flourished more than 2000 years before the birth of Christ. A year later, excavations began on a second city near the railway at Mohenjo-daro, the ‘Hill of the Dead’, and 640 km to the south. The discoveries here shed light on the mysteries of Harappa. Further investigations uncovered the remains of smaller settlement over the vast area, from present day Karachi to the mouth of the Narmada River, and eastwards as far as modern Delhi. The earliest settlers in the Indus valley arrived in the 4th millennium BC. Between 2700 and 2600 BC, uniformly planned towns and cities emerged and the entire Indus region became culturally unified. The massive city walls of Harappa were constructed during this time of transformation. 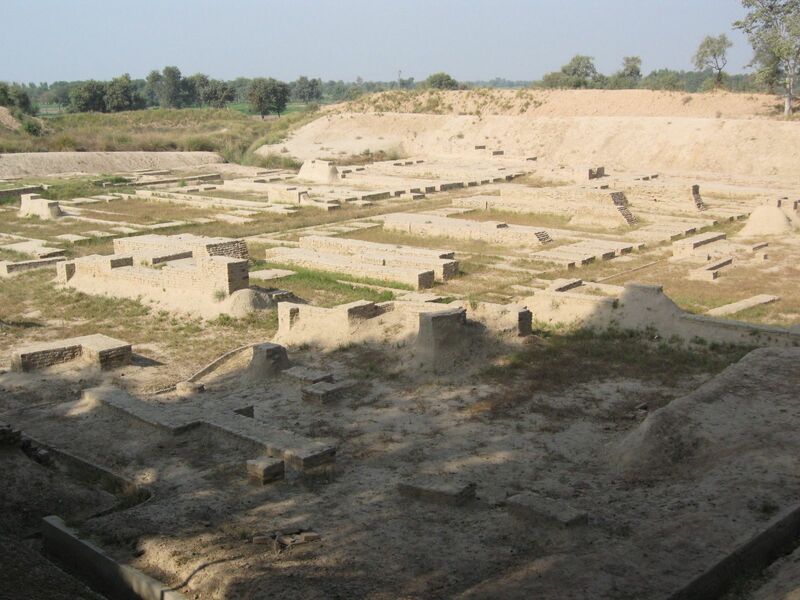 Since the discovery of Harappa and Mohenjo-Daro, other ancient Indus cities have been found, such as Dholavira in Gujarat and Ganweriwala in Cholistan, giving archaeologists further insight onto the urban lifestyle of the Indus civilization.